Enjoy a night out with your friends while you Eat, Drink, and THINK! Answer topical and exciting questions from hilarious categories designed for you and your team to have fun at your bar. Plus, earn a victory in a Trivia game and you’ll be entered into one of our four online National Trivia Championships events - where $10,000 in cash is on the line every year! Each Trivia game lasts about two hours, with three periods (2 rounds each period) consisting of an assortment of questions in each round. For each correct answer, your team receives 10 Brain Cells (points). You can also double your Brain Cells during Period 2 or 3 (Rounds 4, 5, or 6). The team with the most Brain Cells in a period may win a prize from the bar (usually an appetizer or gift card). 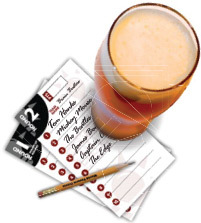 The team with the most Brain Cells on the night wins any prize the bar may offer, PLUS an entry into our quarterly National Trivia Championships! Creating your World Tavern Trivia team is easy. 2 #2: Choose a Team Captain – their email address will be used to register the team. 2 #3: Register your team by clicking the button below. You can add players, create a Team Name, and more. It’s that simple! With more than a dozen categories to choose from, including The Playground (sports), Tone Deaf (music), and Heavy Petting (romance), World Tavern Trivia will excite and challenge your Bar Brain. 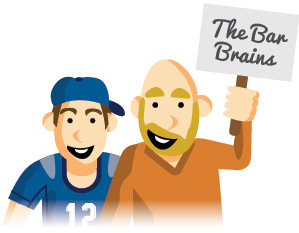 Your Big Brain (the Trivia host) selects the categories for each round. Now you have the opportunity to qualify directly from your bar into our quarterly National Online Championships, where $10,000 is on the line every year! Earn 2,500 Brain Cells over the ﬁrst half of the season and you qualify for the All Star Championships with the Top 3 teams advancing directly into the National Championship! The winning team gets a $500 prize package for Hotel and Travel money for the National Championship! Earn 5,000 Brian Cells during the season (or 2,500 Brian Cells in the 2nd half of the season) and you qualify for the Tavern Championship where the Top 3 teams advance directly into the National Championship with the winning team receiving the Tavern Champion Medals. 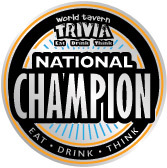 Compete against World Tavern Trivia teams from across the country in this online event held four times each year! $10,000 in cash will be on the line every year: $2,500 for each event held on March 1st, June 1st, Sept 1st, and Dec 1st. Will your team become champions and take down the cash? Teams are ranked based on the number of Brain Cells they earn each season on the Tavern, Regional and National levels. Overall Team rankings on the Leaderbaord are based on each team’s top scores (Top 4 – Tavern, Top 6 – Regional, Top 8 – National). Individual Team Rankings are determined based on cumulative Brain Cells earned and used strictly to determine placement in All Star, Online, Tavern and National Championships. Weeks 13 & 26 are Championship weeks. Your rank based on Brain Cells earned up to that point in any given season. Your rank based on Brain Cells earned during the two seasons that make up a World Tavern Trivia calendar year (From Mid February – Mid February). Earn 10,000 Brain Cells over the course of two seasons and you will be on your way to the National Championship! To view the weekly online bonus question, pre-register your team at the venue where you’ll be playing on the Trivia website. 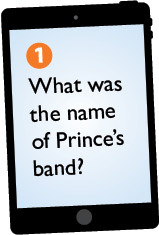 Correct answers are worth 20 Brain Cells, a nice head start for your game! We call your Trivia host the Big Brain. They will run games at our venues each night. Always be nice to them and feel free to tip or buy them a drink for their hard work! During the game, any team using a cell phone, tablet, or similar mobile device, or yelling out an answer, can be disqualified from a round – or the entire game. The Big Brain’s decision on these matters is final. Always play fair! World Tavern Trivia is America’s most exciting trivia game. You won’t want to miss a single week of the action! The more often you play, the better your chance of earning great prizes and your share of $10,000 in cash every year.